Alejandro Seri is an award-winning, bilingual screenwriter and director. 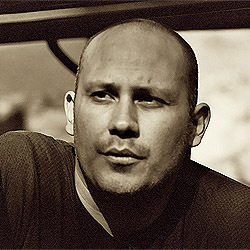 Alejandro started writing screenplays at the age of nineteen while attending UCLA as an Anthropology major. With the help of ten other students, Alejandro started the Cyberpix Film School in downtown Los Angeles. Since then, he has directed a feature film, Placebo Effect, which won awards while playing at the NY Independent Film Festival, the Romanian-American Film Festival and the Lake Tahoe International Film Festival. After apprenticing as a trailer/poster copywriter at the renowned Intralink Film, Alejandro went on to work as a television promo and film trailer copywriter at New Films International. Deciding to reconnect with the storytelling aspect of the craft, Alejandro became a story analyst with Script Pipeline development services before returning to writing. Alejandro joined Final Draft, Inc., in 2007 as the Marketing & Communications Director for both Final Draft, Inc. and Script magazine. He has served as Final Draft, Inc.’s Director of Educational Sales & Marketing since 2011. In 2015, Prospect Park (Wilfred, Crazy Heart) produced Alejandro’s co-written script, Final Girl. Alejandro consults and teaches screenwriting and Final Draft tech classes. His workshops are offered at universities, conferences, festivals and online. Alejandro Seri, Director of Education, will show off the exciting new features in the NEW Final Draft 11.